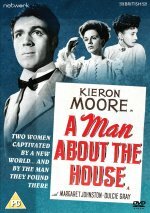 Two English spinster sisters (Margaret Johnston, Dulcie Gray) take up residence in a Neapolitan villa they have inherited and are charmed by the handsome young Italian (Kieron Moore) who is caring for the place. He marries Johnston, but slowly poisons her in order to get back the property, which once belonged to his family. A suitably brooding British-made melodrama, directed by Leslie Arliss, this was serviceable enough in its day but seems rather drearily predictable now. The photography is by ace cinematographer Georges Périnal.